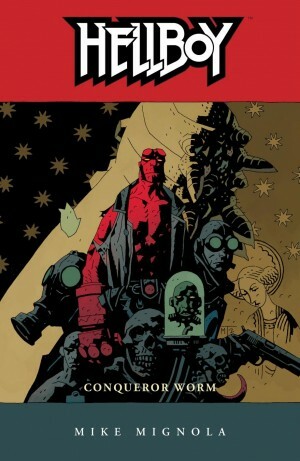 The title for this fifth volume of Mike Mignola’s Hellboy series comes from a poem by Edgar Allan Poe called Ligiea, for reasons that will become clear later on. A space capsule, launched by Nazis at the end of World War II, is returning to Earth with a terrifying occupant. 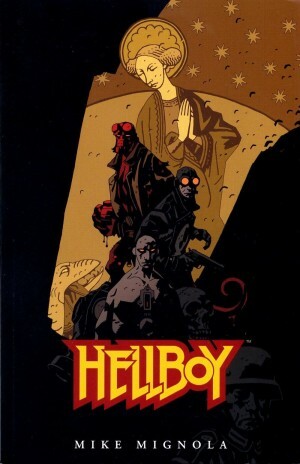 Hellboy and Roger the Homunculus travel to Norway to intercept it, where they encounter Lobster Johnson, an adventurer from World War II. Of course where there are Nazis, there is sure to be Herman Von Klempt, the Nazi-head-in-a-bottle and his robotic gorilla Kriegaffe. And lurking in the shadows once again, Rasputin. 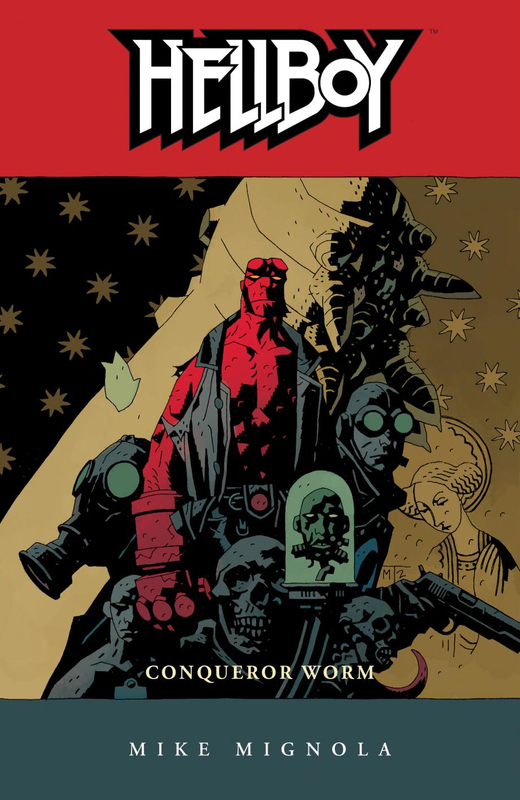 Conqueror Worm has a lot of the same elements as previous Hellboy stories but things are far less straightforward for him this time around: his bosses at the B.P.R.D. (Bureau of Paranormal Investigation) suddenly pose as big a problem for him as any of the villains, as he is forced to choose between loyalty to the Bureau or compromising his integrity and betraying a trust. 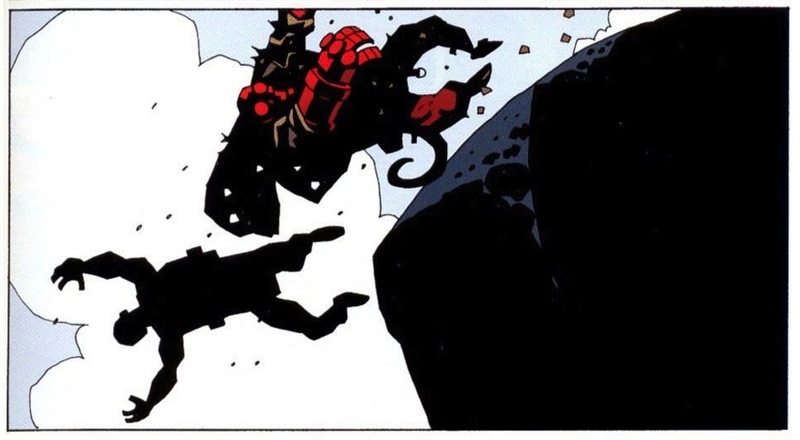 Mignola’s art in Conqueror Worm continues to evolve, reducing the density of lines making up a picture while still retaining all its power to create stunning imagery through placement of shape and carefully designed positive and negative space. Action is balanced by lots of static inset panels of moody imagery that hint at unspoken or subterranean themes in the narrative. The colouring is again a strong partner in the storytelling. 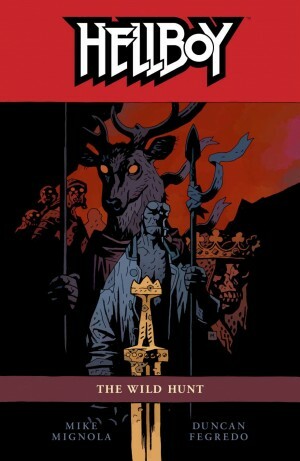 Dave Stewart matches the black inks with bright yellows for action, palest wintery blues, bright white and distant greens for the environment and darkly sombre grey browns for the interiors, colours for emotional impact that add tremendously to the feel and the strangeness of these pages. 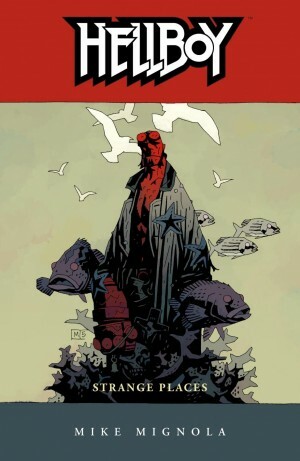 It’s a very satisfying combo and at the end of this book, there are some big decisions for Hellboy to make that will lead immediately into Hellboy: Strange Places. 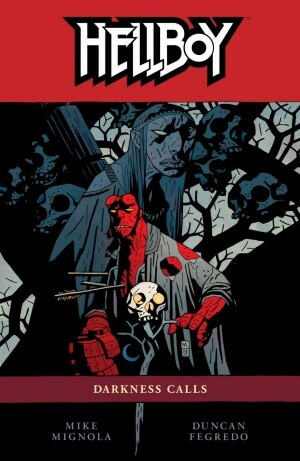 There’s an introduction by Guillermo del Toro and a few sketchbook pages. 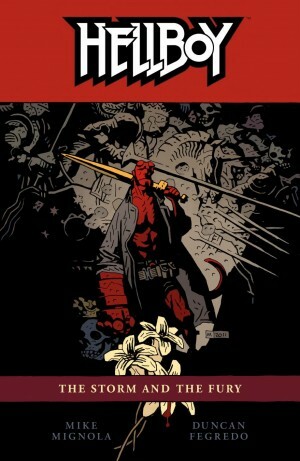 This book and the next volume are also reprinted at a much larger size in the archival hardcover Hellboy Library Edition: Volume Three.